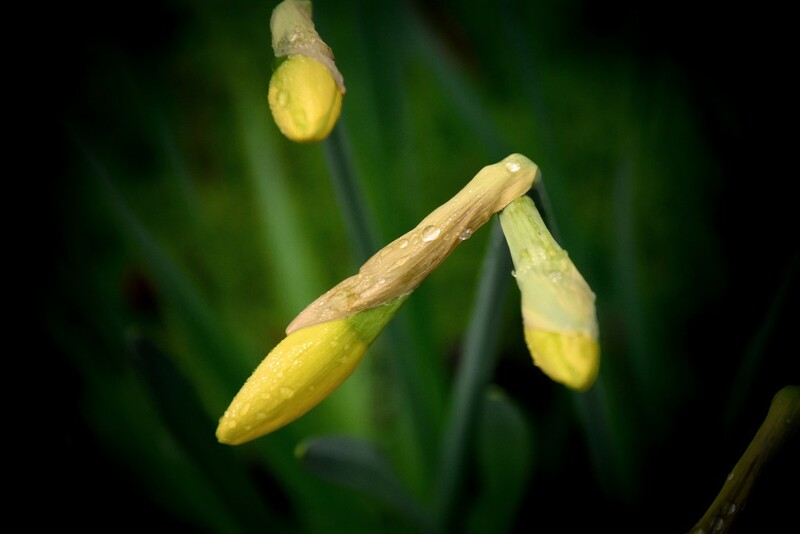 In honour of St David's Day today and the Meteorological 1st Day of Spring in the UK, I have some daffodils in bud. Ready to burst out and herald in the Spring, it is - of course - raining today. What else? Nice to be able to photograph in colour and not convert to black and white today, yay! Oh yes - yea for some lovely yellow!! Reminds me of Carla Bruni singing 'Promises'! Yay, colour, after seeing so many photos last month in monochrome I thought I had gone colour blind. Good DOF and shot. The daffs are starting to bloom. Beautiful spring capture. I can't wait to see them after they open. Beautiful buds! I love daffodils as they are a promise of Springtime! lovely shot ,but a bit late for St.David. A nice shot of nature reawakening. We have a ways to go yet before our daffodils come up. We will have about 8 inches of snow before the weekend is out then some bitter cold again for the coming week. March really is coming in like a lion here. Pretty, love the rain drops. Well we can bemoan the rain but it can give some great shots and this is lovely. I have just laid a lawn so bring on the rain! Lovely capture with the raindrops. I love daffodils- my favorite flower- so they seem quite appropriate for welcoming the color back into your project! I just love daffies, they herald spring here too, though it probably wouldn't be raining. Seems to have forgotten how to do that. Nice shot. We don't get daffs here . I miss them. Beautiful shot for spring. The rain drops were a nice touch. So pretty with those droplets of water.